Want to learn how to tell a story from some of the best storytellers in NYC? Of course you do! Magnet Theater Storytelling Instructors Adam Wade (20 time Moth Story Slam Champion) and Robert Weinstein (The Moth Podcast/Radio Hour) will teach you how how to take personal experiences from your life and create stories that are universal and identifiable for an audience. You'll be blown away at how engaging your personal stories can be! Whether you're a Moth Slam Champion in the making, a writer seeking to fine tune your narrative skills, or someone who wants the confidence and ability to get in front of people and be heard -- this class will help. In this class you will learn the basic elements of telling a narrative story, how to take a crowd by surprise and make them care, how to be real and truthful on stage, and how to discover and communicate the real meaning behind your experience. Classes will include verbal and written exercises, examples of performances from some of the finest storytellers, and various techniques and approaches to prepare yourself for a performance of your story. What you'll get out of the class: at least one polished, six-to-eight minute story -- which could be a Moth Story Slam winner, the beginning of a one-person show, or a personal essay -- and the fundamentals needed to develop future stories. The class concludes with a graduation performance where you will perform your personal story in front of a live, super-supportive audience! Adam is a well respected and seasoned teacher of his craft. Besides proudly teaching storytelling here at the Magnet since 2010, he has conducted workshops at The New York Times, the United Nations, UNICEF, PEN America, Breakthrough Human Rights Organization, and the Iraq and Afghanistan Veterans of America (IAVA), as well as Fleishman Hillard, Edelman, Makerbot, Sir Kensington's, and ADP. He has also taught special advance storytelling classes for students at CUNY Grad School of Journalism, Mercy College, and Pace University. In December 2017, Adam teamed up with Airbnb to create his very own NYC Storytelling Experience. For the last fourteen years, Adam has been a fixture in both the New York City storytelling and comedy scenes. He's the winner of 20 SLAMS at The Moth (18 StorySLAM victories and 2 GrandSLAM Championships) with 20 different winning stories. 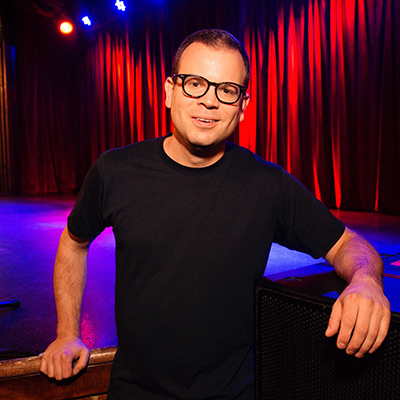 He's toured North America with The Moth Main Stage and has been featured on NPR's The Moth Radio Hour and The Moth Podcast. His stories have also been heard on NPR's Snap Judgment, NPR's All Things Considered and locally on WNYC. He's performed on shows such as Magnet Theater's Armando Diaz Experience (guest monologist), Upright Citizens Brigade Theatre's Asssscat 3000 (guest monologist), Night Train with Wyatt Cenac, Whiplash, Sweet, Mortified, and RISK. He's been profiled in the New York Times, The New Yorker Magazine, and Time Out New York and has appeared on HBO's GIRLS, Comedy Central's Inside with Amy Schumer, ESPN, and Late Night with Conan O'Brien. He has also written for New York Times, New York Press, Glamour Magazine, ESPN The Magazine, and Hoboken Reporter. In Autumn 2015, Adam's debut live storytelling/comedy album "The Human Comedy" was released by Comedy Dynamics and made it up to #3 on the iTunes Comedy Chart. His upcoming album "Live at the Magnet Theater" will be released in the Spring of 2018.